Last night I was busy making date balls for Nick. He loves them and they're great at lunch, while mountain biking or during long hikes. This time I used strawberries and decided to freeze them... now they're more dessert like. Hope you enjoy them as much as we do! Pulverize dates in a food processor until a paste forms, about 40 seconds (the paste will typically clump together). Add walnuts & macadamia nuts & blend until very finely chopped, about 35 seconds. With the blade still running, drizzle in coconut oil & stop as soon as the oil is blended in. Scrape the batter into a bowl stir in berries & 1/4 cup of the coconut. 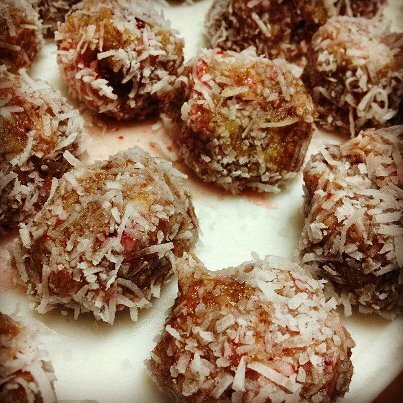 Form the batter into round balls, then roll in leftover shredded coconut. refrigerate for snacking.